yesterday was second day of dry fast for me and mango. i had busy day, mango woke me up at 8am i wanted sleep, so after tiny wee and poo i had cold shower and even after i could easily go back to my sweet sleep. not for long, i was euphoric and giggly at times within few minutes. i was fully peaceful all day and i had no negative thoughts.i enjoyed every second of my existence even in the middle of the big city... it was raining and 2 and 1/2 hours/one way/ traveling on public transport ahead of me.mango gave me lift to better bus stop and to save some time. i went see a friend. i arrived back to shoebox before 6pm. and i noticed that mango look bit sick, and yeah, he is telling me how he felt sick on the way back, he vomited twice. he was very quiet and peaceful. when i got sleepy i jumped in bed and i could not sleep but i was peaceful about it. i knew the morning will come and i will have my watermelon juice. i was looking so much forward to it. i was not hungry. i was hungry around 6pm, but only for very short time. so all night i was sleeping and waking up lot and at 4am mango woke up and asked me if i am for watermelon juice and i said yes, please, he made it for us and we both have our first watermelon juice in bed and very soon after i slept like a baby for about 3 hours. me and mango shared very very sweet watermelon juice9 times each 5dl, at times bit or more over, yeah we drunk two big watermelons today, yum, yum, yum. we also went and got 7 huge watermelons, 29 cents kg. the biggest was 8.5kg. they joined other 11 watermelons in our shoebox we got earlier, when fresh, they keep that way for some time. 18 watermelons. 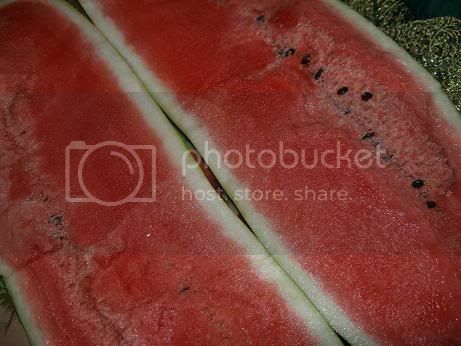 watermelon fruit full of LIFE. WATER OF LIFE. sweet sweet nectar. i love it. wow to sweet oz watermelons! today was warm rainy day, me and mango peacefully relaxed most of the day and night and we truly enjoyed all we did. i am content and satisfied. our garden turned in to jungle. You really seem to live a blessed existence Kveta. thankyou fylype, i am happy to know that i inspire you. yes, everyone whom live the fruit life is truly blessed.